I was talking to a British officer last night and he told me the most wonderful ghost story. Dinner parties are great for collecting ghost stories. After a few glasses of wine, everyone wants to share a story or two. Although I gathered several stories and a bit of a hangover last night, this story was the most historically rich and easy to research so I went with the path of least resistance. The officer I was talking with told me a story from his youth when he was still in military school. He and his classmates were placed at Wellbeck Abbey. Wellbeck Abbey is in Nottinghamshire and has a long history. It was founded in the 12th century as a house of God. 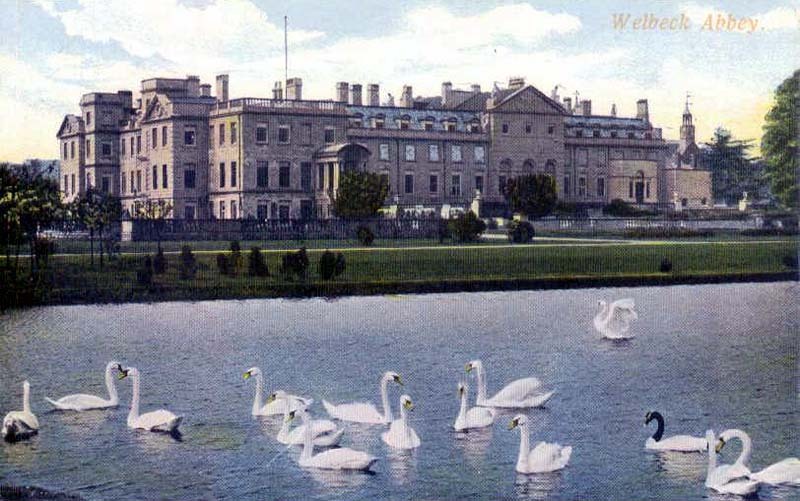 After Henry VII dissolved all of the Catholic Church's holdings it was placed in private ownership.Welbeck became the family seat of the early Dukes of Newcastle. In the 18th century, it passed through an heiress into the Bentinck family and became the main seat of the Earls and Dukes of Portland. While these Dukes owned the Abbey, the renovated it and extended it a made it larger and more luxurious. The 5th Duke also excavated underground chambers. According to my source, part of the abbey was used as a school and he and his peers were placed in these underground chambers. They were used as dorms. He knew nothing of the history of the abbey and is a sensible gentleman, but he recalls the room he stayed in at Wellbeck as being quite haunted. He recalls one night waking up in the middle of the night to see what he thought was his roommate waking up and brushing his hair and washing his face. It was very early, but since it was the military this seemed reasonable and he went back to sleep. When he woke later to his roommate getting ready he asked him if he hadn't already gotten ready and his roommate said no. Later his other roommate (there were three to a room) described seeing a similar event early in the morning. The officer also describes feeling someone tapping him on the shoulder while he was brushing his hair in the morning. All three young men, believed their room was haunted. They felt no malevolence, but they felt sure they weren't the only ones staying in the small room at Wellbeck Abbey. Very cool. I would absolutely LOVE to go to Europe and visit places like this. Would be a dream come true! cool! ghost stories are so much more fascinating when THE person who experienced the event is narrating it. lucky you! The hangover was worth it!